Print pattern and enlarge to appropriate size for your pillowcase. Paint rabbit orange, the nose and inner ears pink, and eyes and whiskers black. Paint the base colors of each egg. We used purple, light green and yellow. Paint the decorations on each egg. We used pink and yellow for the flowers, and yellow, green, turquoise and pink for the other decorations. Place dry painted pattern face down on pillowcase and iron according to bottle directions. Tie bows from ribbon and hot glue or hand sew along the bottom of the pillowcase. 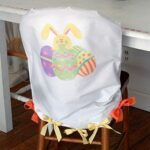 This project for Easter Egg and Bunny Chair Cover was printed from CraftsbyAmanda.com - https://craftsbyamanda.com/easter-egg-and-bunny-chair-cover/ and can only be printed for education or personal use.